The story behind Costa Rica's "Grampa Ninja"
Fred Grotenhuis, aka Grampa Ninja had been piloting helicopters, fixed wing, hot air balloons and powered parachutes for over 44 years. He started his flying career in 1966 as a helicopter pilot in the military. Afterwards he served in the reserves and also took up flying fixed wing. In the 80's he got his balloon license and in 2000 purchased his first powered parachute. Fred was introduced to paragliding in 2002, quickly achieved his P2 rating and didn't look back since. In 2002 Fred Grotenhuis began exploring sites in Costa Rica. There he met up with a group of young pilots that pioneered some launch sites that to some other paragliders seemed overly challenging. 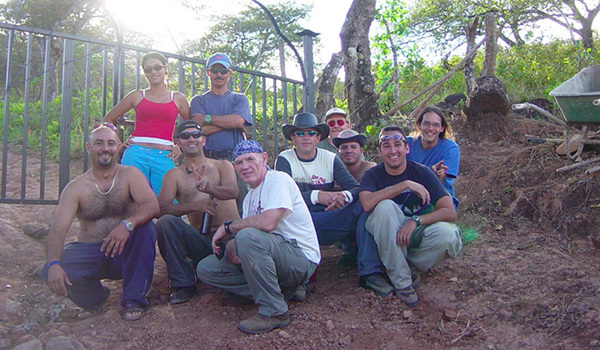 This group became known in Costa Rica paragliding circles as The Ninjas. At the time Fred began paragliding he was almost 60 years of age and his spanish was very limited. The Ninjas gladly welcomed Fred, but what Fred didn't know was they also nicknamed him Grampa Ninja in spanish. One day someone spilled the beans and in the same way The Ninja's embraced Fred, he embraced the name. As Fred's passion for Costa Rica and paragliding grew, he decided to build a bed and breakfast and called it Grampa Ninja's B&C (bed and coffee). The Bed and Coffee was open during Costa Rica's premier flying time (December to April). In 2009 the B&C evolved into an official B&B serving a full breakfast to guests. Years later Fred and Alex, owner of Tandem Paraglide Costa Rica, met around 2012 and they quickly struck up a friendship. Today Alex carries on in the tradition of Grampa Ninja, sharing his enthusiasm for flying and enterprenureal spirit.